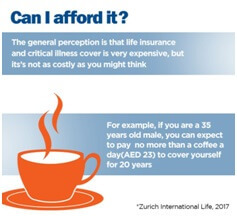 “Why do I need Critical Illness cover? I have Medical Insurance” This is the typical reaction I get when I ask friends if they have a critical illness cover? Let’s start with the very basic- What is a critical illness cover? This is a cover which pays out a lumpsum (sum assured) when one is diagnosed with a major listed illness. 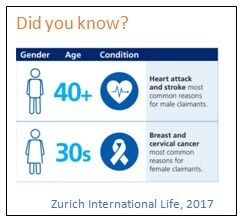 Most of the insurance companies’ critical illness list typically include about 32 illnesses like cancer, stroke, first heart attack, motor neuron disease and more. Let us look at two real life examples which illustrate how this lumpsum payout could have significantly helped these individuals. Story 1: Mrs. Sultan, an Arab national, was recently diagnosed with breast cancer in 2018. She has an above average enhanced medical insurance policy which was sufficient to met her regular medical insurance needs. However, when she got diagnosed with breast cancer the doctor prescribed many tests which aren’t typically covered by most insurance policies. The cost of treatment has now surpassed the available limits on her medical policy. Mrs. Sultan and her family are now digging into their savings to pay for these medical tests. Not only that Mrs. Sultan has young school going kids. Though she received some support from her family, she has had to hire some additional help at home to help take care of kids and manage the household while she is undergoing treatment. The financial stress in addition to the emotional stress of the illness has taken a significant toll on the couple. A critical illness policy would have saved a lot of the agony, at least the financial ones, for the Sultans. Story 2: Mr. Majumdar, aged 35 years,was working as one of the Directors at a large financial firm in DIFC. Due to economic stresses the company decided to shut operations in 2010. All employees were made redundant. Back in 2007,I had asked Mr. Majumdar to consider having a critical illness policy but after a lot of back and forth, he concluded that his medical insurance provided him sufficient cover and that he didn’t see the need to buy a critical illness policy. couldn’t be worse. He had NO MEDICAL INSURANCE to start with;two young kids with one ready to start schooling and; a household living expenses that won’t take a break. Buying a new medical insurance was not an option as medical insurance gets more expensive when a severe medical condition is already diagnosed. Mr. Majumdar had to depend on social service organizations to fund his cancer treatment and all his savings were exhausted to ensure that his family is comfortable. Had he CHOSEN TO BUY A CRITICAL ILLNESS policy, the scenario would have been different. He would have been paid a lumpsum (for eg. USD 250,000) as soon as he was diagnosed with cancer. He would have paid for his treatment without having the stress of where money for his treatment would come from. Instead of losing sleep over what has happened, he could have recovered faster, with his savings still intact.